You are currently browsing the tag archive for the ‘New York City’ tag. Our backstage guide, Sal, talking about the Elizabethan Theatre. 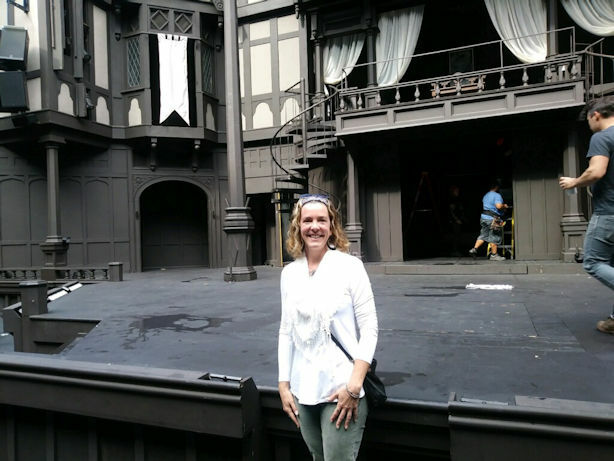 I made my debut on the Elizabethan Theatre stage!! Then they asked me to get off – for safety reasons. Ha ha ha ha!! Margaret and I met up for a vacation a little closer to home than our two most recent trips to Chile and to Myanmar. This time, we went to southern Oregon! She drove north 5 1/2 hours from Santa Rosa and I drove south 5 1/2 hours from Rainier. We met at a hotel in Ashland. The town of Ashland, in Southern Oregon, is famous for its Oregon Shakespeare Festival (OSF), founded in 1935. These days it’s a pretty big deal. Wikipedia says “Each year, the Festival offers 750 to 800 performances from February through late October or early November, to a total audience of about 400,000. The company consists of about 675 paid staff and 700 volunteers.” The website also notes that by 2015, 20 million people had attended. Even though my mother went to high school in Ashland, and my grandmother lived here when I was a kid, and I have family that lived in the area for decades, and even while I traveled through constantly on my way to northern California to pick up and deliver Tara while their dad and I were sharing custody, and even though I have lived in Oregon for the last 11 years, this was my very first visit to Ashland for the purpose of seeing Shakespeare. It’s about damned time. We had tickets to two matinees (they’re expensive – I couldn’t afford more), one Tuesday and one Wednesday. We arrived Saturday night and entertained ourselves with other things Sunday and Monday. We did a couple of hikes, one of them the morning before our Tuesday show. I’ll get to all that stuff later. Stay tuned. The first play we saw was Manahatta, by Mary Kathryn Nagle at the Thomas Theatre. It was my choice that we see this one, because the playwright is Cherokee, and I continue my quest to learn about my Native history and support other Indians when I can. Two stories are told at once, overlapping. 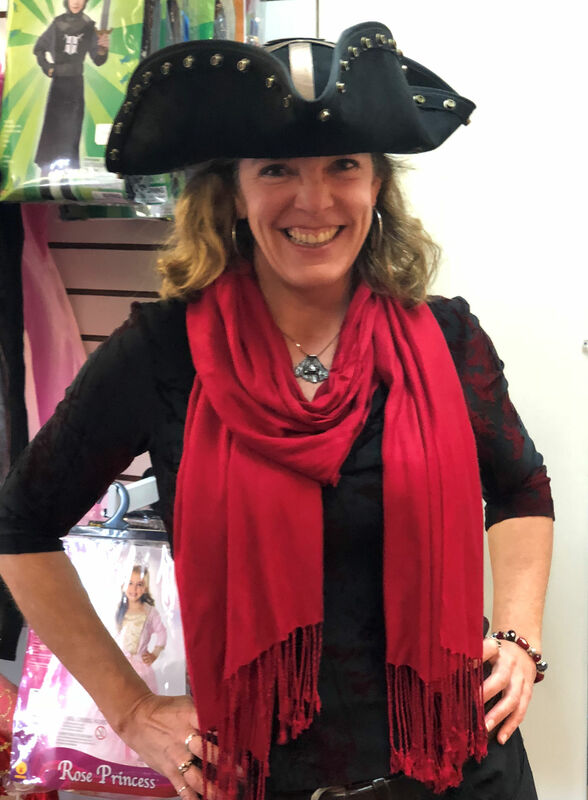 One is set in the 17th Century when Dutch colonists were recently arrived on the island called Manahatta by the occupants and while trading with the local Lenape Indians, decided they wanted control of their land. The other is set on precisely the same piece of land, 380 years later called Manhattan, as a modern Lenape woman fights her way into employent at the white male dominated Lehman Brothers bank and begins to make a name for herself on Wall Street. The young woman in both stories is at first filled with hope of youth and all the possibilities of life ahead of her, and both are eventually devastated through wrenching tragedy. The Dutch trick the Lenape into allowing them to settle on the island, and then the kick all the Indians off the island and build a wall to keep them out, then shoot and kill her husband and father of her unborn child. The wall is later immortalized in the name of a street in Manhattan, synonymous with a financial center. Lehman Brothers is embroiled in sub-prime mortgage lending and fails and the young woman knows she was a part of the bad practices, while simultaneously the woman’s childhood home is foreclosed upon, making her own mother homeless. That line wrecked me. I am no Indian activist, but I guess with the years that I have spent learning over and over and over how to recognize subtle and sometimes unintentional but always consequential attempts to erase indigenous Americans, I too have begun to feel a resonant idignation at how hard it is to convince people that we are here. Right in front of you all: we are here! Living in 2018, using smart phones, running companies, getting graduate degrees, flying cross country to visit grandma, standing in line at Starbucks, watching Netflix, marrying and having families and shopping at Target. That night my friend decided that we should do a backstage tour the next morning, only $20 each. We both went on line to try and book one, but we couldn’t make it work. She called the box office to buy tickets and was informed that first of all the backstage tours are only available to OSF members (minimum membership $35), and second of all the tours were sold out for Wednesday. The man on the phone said that sometimes there are tickets available just before the tour, when someone returns tickets they can’t use…but they are still only available to members. Margaret did not recognise any particular obstacle. At 9:30 am we showed up at the box office and asked if any tour spots had opened up. None had. Margaret walked out the door and began questioning people sitting on rock walls and benches waiting for the tour to begin, “Hi! Do you have any extra tickets?” Can you believe it: after asking her third group of people, a woman nearby overheard and came over to tell us that her daughter could not come and would soon be returning two tickets and she would not accept payment for them. Viola! Margaret waited and sure enough, soon she had the other woman’s tickets. She took those into the box office and asked to get them converted to our names. Margaret was told she couldn’t use them because 1) we are not members and 2) these are special tickets for handicapped people anyway. My ballsy friend met me outside with all the other waiting people who were now queuing up at the doors of the Thomas Theatre, where the tour would begin. “Just get in line,” she says to me, conspiratorially. As we arrived at the door, the man taking tickets burst out laughing at something someone behind him had said. Still chuckling, he took our tickets and added them to his growing stack of tickets, and joked to us about the funny thing that happened. He then turned to the people in line behind us. He never even LOOKED at our tickets! Boom. Backstage Tour. For free. Not members. 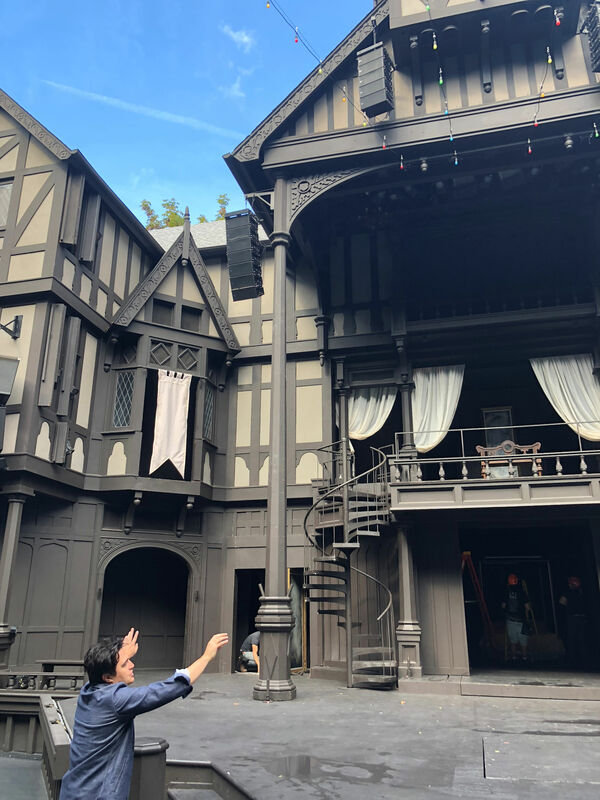 In the Thomas Theatre, we were told about the history of the Oregon Shakespeare Festival, and about the amazing versatility of Ashland’s newest theatre: the Thomas Theatre, in which every single seat can be moved and the audience and stage rearranged in any configuration you like. We were handed off to a second tour guide, actor Christopher Salazar, who asked us to call him Sal. We crossed the street to the Elizabethan Theatre and went underground to the tunnel connecting it to the adjacent Bowman Theatre. We sat in the Green Room and learned about the incredible choreography of making this festival happen. Think about it: typically when there is a play, it continues on the same stage daytime and evening, for months until the run is over. However! In Ashland, festival directors want visitors to be able to see every single play in 10 days, or to be able to choose from multiple options each day, no matter how short your visit. This season there are 10 separate productions using three stages. That means a complete breakdown and set up of the stage twice a day for two theatres and once a day for the other theatre. Wow. We then walked over to the Angus Bowman Theatre, named for the founder of the Oregon Shakespeare Festival, and Sal told us about his favourite part of OSF: the outreach productions into communities not able to participate in the festival itself. Our final stop was backstage at the Elizabethan, an open air theatre, where Sal (currently an actor in multiple productions at the festival) described how many of the people are employed behind the scenes, stories about inspiration for costumes, economies for typical actors at OSF, and what it’s like to have to change from one character to another in less than a minute, while running from exit to entrance behind the scene, dropping pieces of costume onto the floor and pushing arms into clothing extended by waiting assistants. The tour was fabulous! And highly recommended, even if you need to go the route of obtaining membership, followed by purchasing an available ticket. We lunched, then explored lovely Lithia Park that borders the theatres, before returning to the Thomas once more for our matinee show of Henry V. In the intimate Thomas Theatre, we recognised Sal right away in one of the five roles he plays in Henry V. He all but winked at us when he spotted us, only 15 feet away. This was my first exposure to Henry V. I hadn’t even read it before. I learned long ago that it’s helpful to research prior to seeing a Shakespeare play for the first time, so I had crammed a little in the hotel room the night before. 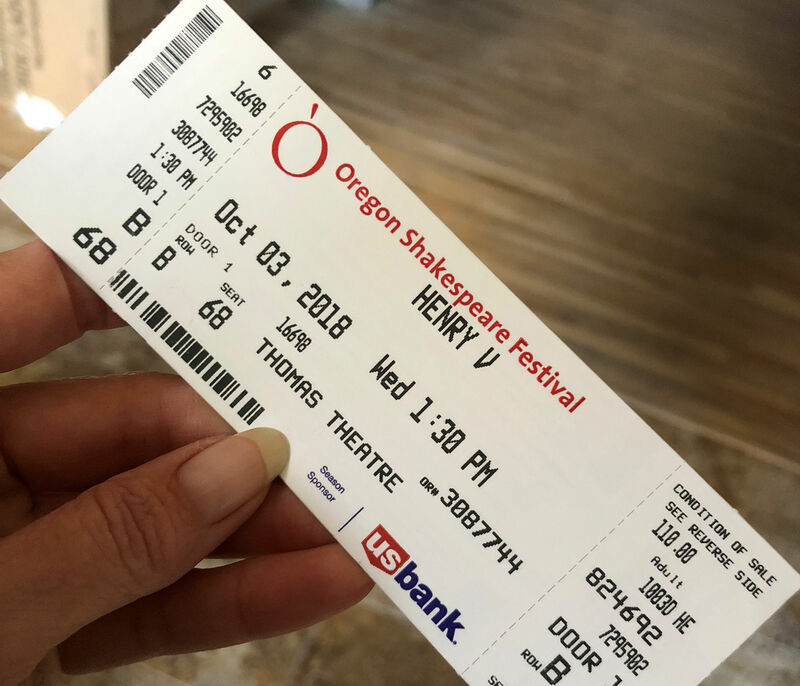 Basically the story tells the tale of King Henry V as he has just ascended the throne and no one is quite sure what kind of king he’ll be, especially considering his history as a carouser. He turns out to be a good king: strong, fair, and in multiple ways still a confused young man. His leadership is outstanding and he conquers France by sheer force of will, and finds his match in a woman. Daniel Jose Molina is phenomenal as Henry. I understand now why the Henry V performances sold out so fast. Molina lets himself go so freely that I think for the first time I recognise, in hindsight, that every other actor I’ve seen has been holding back the tiniest bit. I was all in from the first scene. What really strikes me with this actor is his body language and facial expressions that go beyond flattering hyperbole I’ve heard before. This stuff is for real. Just watch his FACE, and somehow you know what’s in the character’s mind, and then…watch it change as the character has a new thought…and realize even before the next line is spoken, that the character has told you what he’s going to do and you’re right there in on it with him. What an extraordinary, personal way to be introduced to this typically massive play, in a small theatre with only 12 actors other than those in the ensemble. I was so close I could see the notch in his eyebrow: not sure if it’s from a scar, or is a bit of fashion. I found Molina’s Instagram page and I’m following him now, because he (like my actor friend, Sheldon Best) is going to blow my mind periodically with his artistry, and I want to be there to see it. As soon as the lights came up, we slipped out of the theatre ahead of everyone else and got totally soaked in the rain as we hurried to the Jeep (glad I wasn’t in the Elizabethan just then). I gave M a ride back to the hotel to get her car. Then we hugged goodbye and hit I-5 going opposite directions. First time in New York City! 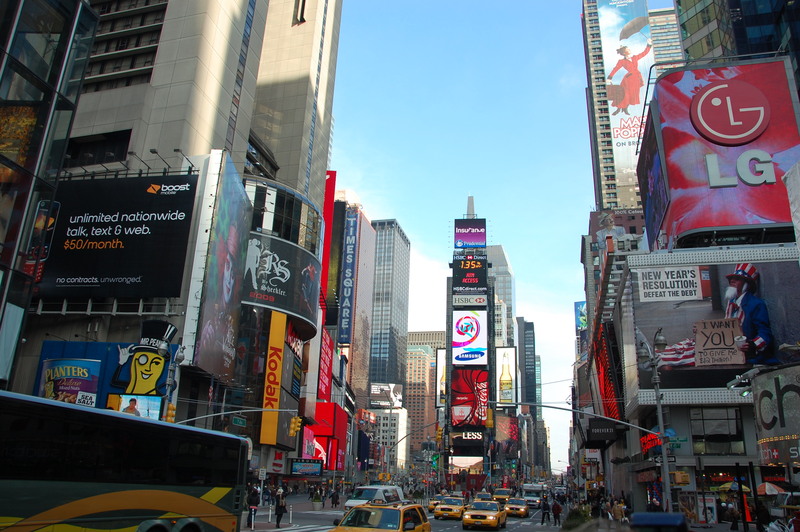 Times Square in all its wonderful excess! We half slept in and half got up early. Sort of a compromise, designed to get the most out of our day without beginning the trip with too much of a sleep deficit. I made a spur of the moment decision which at first seemed rash, but seems more reasonable the more I think about it (don’tcha just love rationalization?). In any case, I shelled out $140 for a round trip taxi ride for the two of us from the hotel to downtown Manhattan, then the guy came and picked us up again when we were done and took us to the hotel to get our bags, then directly to the Egypt Air check-in. Expensive cab ride, but it was worth it because it bought us another hour at least in the city (probably two hours), without any stress about using the subway, or catching the right hotel shuttle to the airport. 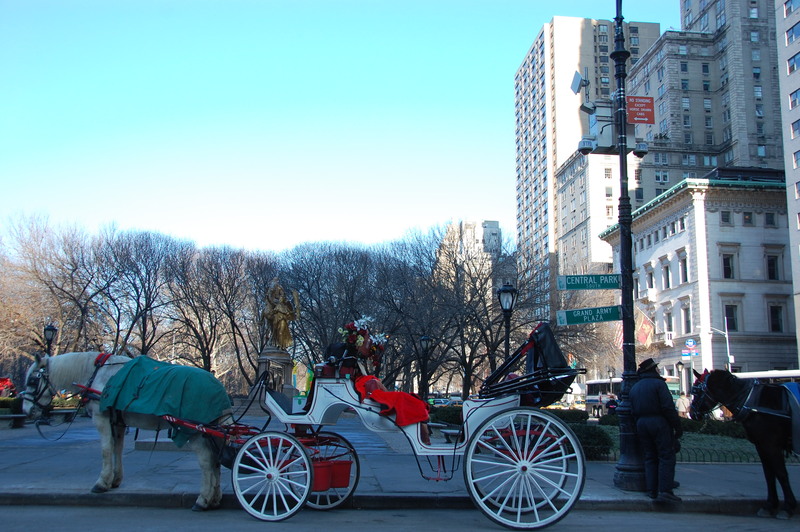 We arrived in Manhattan around 10:15am, and climbed back into the cab at almost 2pm. It was a very short visit. So we were pleased to have been able to do everything we managed to do!! Tara had it in her mind that she must visit a comic book shop in New York City. Don’t ask me where that came from. Our first stop was at an address I found online, but it turned out to be a location that was no longer selling comics, and is now more like a hotel lobby. Luckily, the man at the desk knew the comic book shop had closed long ago, and we were able to move right on to the next stop. We began walking in a direction that I recalled would lead us to another comic store, but stumbled onto Times Square. Wow! What an excess of neon advertisement. It’s a tremendous section of the city – with action and colour and the sheer dimension of everything enough to pop our mouths open. 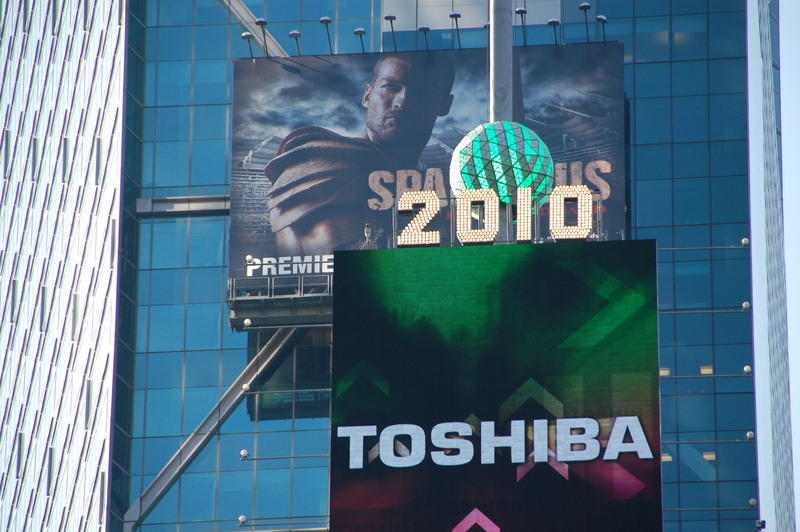 We saw the great ball above a tower proclaiming 2010. I didn’t expect to see the ball – assuming it was removed each year on January 2. There was still multicolored confetti from the New Year’s celebration all over the streets and blowing in the wind. First we stepped into a Toys R Us store, just because it looked amazing from the street. After getting our photos taken the moment we stepped in (just like at a theme park! 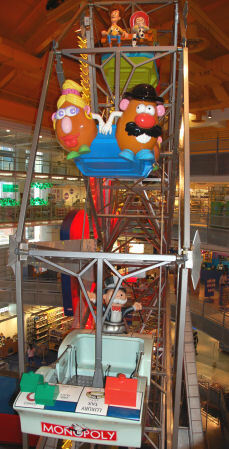 ), we saw a Ferris wheel inside the building. That gives you some sense of how large it is; four stories that dropped below street level. 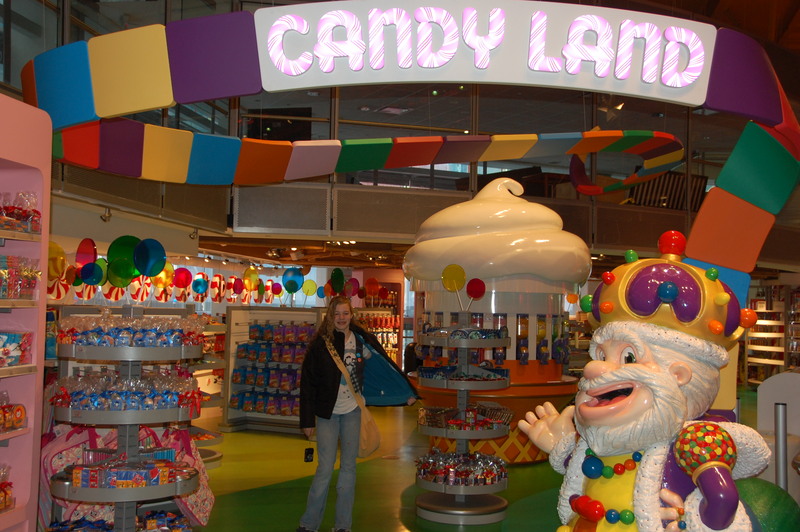 It’s divided into themed sections like Disney, Legoland, Barbieland, and Candyland. We rode the escalators and breezed through the store that exploded with lights and bright colours enough to be worthy of its prime location in Times Square. Next on our list was the library that Gramilda had recommended, though I must admit we looked for it only because she said so, and not because either of us had any inclination whatsoever to visit a library. We went there via Bryant Park, which afforded our first good view of the Empire State Building. Tara fed dried fruit to the birds in the park, and then we watched people skating for a while on the temporary rink set up in front of the library. 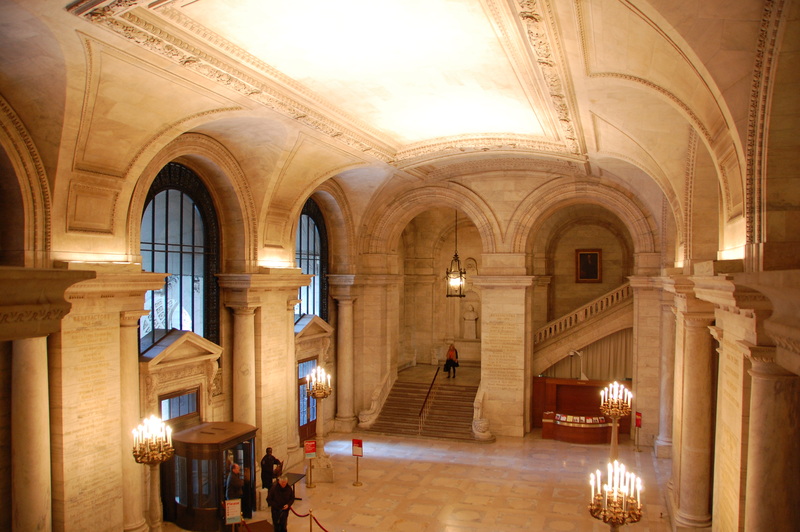 The New York City public library is a stop not to be missed by anyone in the city. I am SO grateful we have a learned, traveled grandmother. We came in by a side door and thus happened accidentally upon the stunning foyer at the front entrance by approaching it from a second floor balcony. 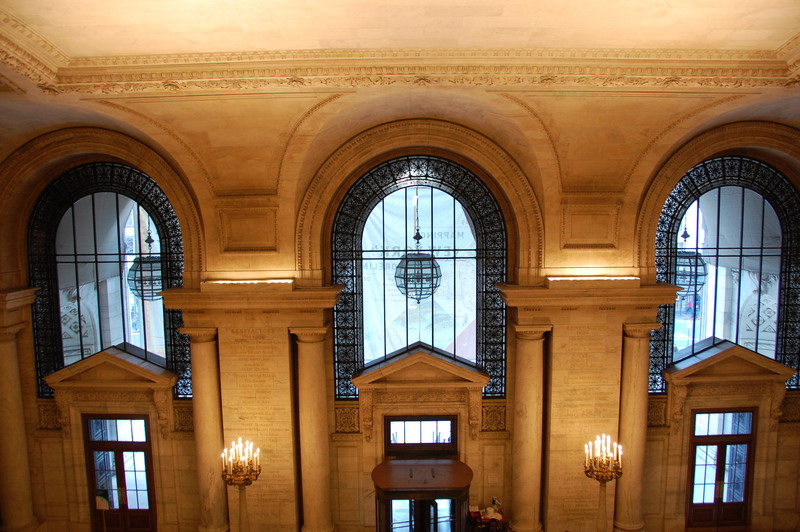 Marble floors, marble walls, staircases, arches, ceilings, columns, and even marble benches inside. It all glistened from polishing, and glowed pale caramel and cream. Chandeliers cast fiery sparks onto everything. 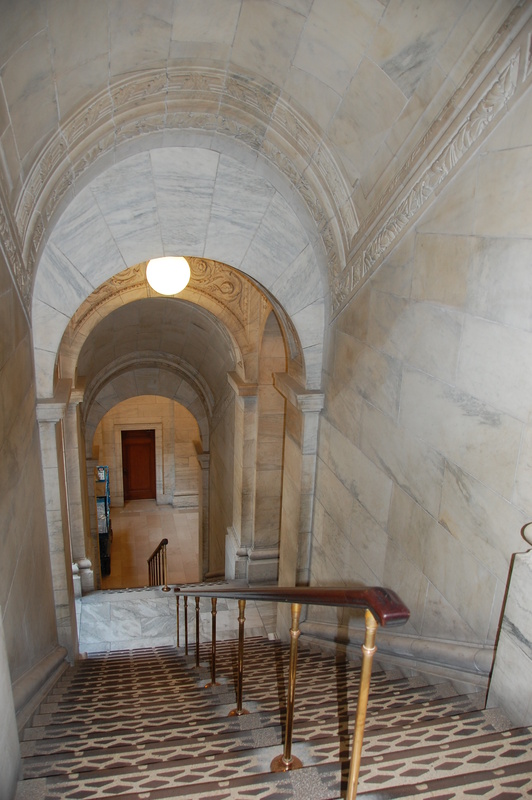 We walked down the long marble staircase on one side of the room, crossed the foyer and then walked up the long marble staircase on the other side of the room. All the while our heads were tipped dangerously backward and we walked in waving arcs as we tried to see everything from every perspective (and not fall down while we were at it!). The library is huge, with many staircases and corridors, so we drifted and gaped and continued to rise in elevation until we happened upon the crowning sight of them all: the McGraw Rotunda. A midsized room with 25 foot ceilings covered on all sides with handcrafted wood trimming, hand painted decorative borders, and then huge murals depicting the evolution of the printed word – beginning with Moses’ stone tablets. Tara and I were in awe. We were forced to sit and stare in silence for a long time, in order to absorb it. 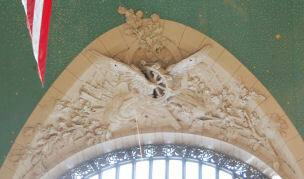 The intricate detail surrounding us is difficult to do justice to with words. 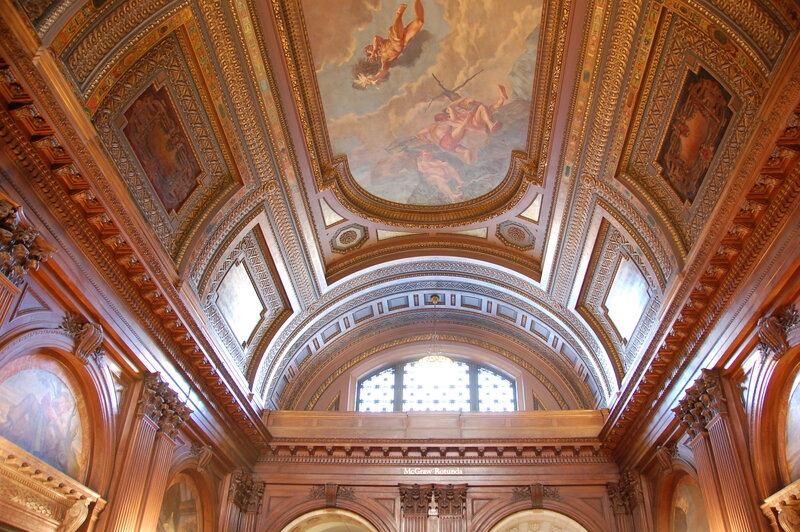 Rather, I insist that if you are ever in Manhattan, do not do not do not miss the library. Off we skipped back into the street and began looking for Rockefeller Plaza and New York’s 9th tallest building – the GE building. 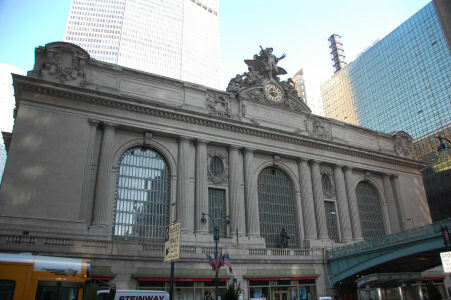 We were distracted by stumbling upon Grand Central Station. Wow. What a city. It’s like Athens, almost, in that a person carelessly walking along busy impersonal streets repeatedly comes face to face with a landmark from history. And like Athens, there was often no one other than me standing there gasping “look at that!” Of course we went inside, to say that we had. I knew it was another public place that would have no queues and no fee to explore. We were unimpressed, and would have done better to discover the train station prior to the library. To be honest, Union Station in Washington, D.C. is much more of a show-stopper. But this one certainly was worth looking at. 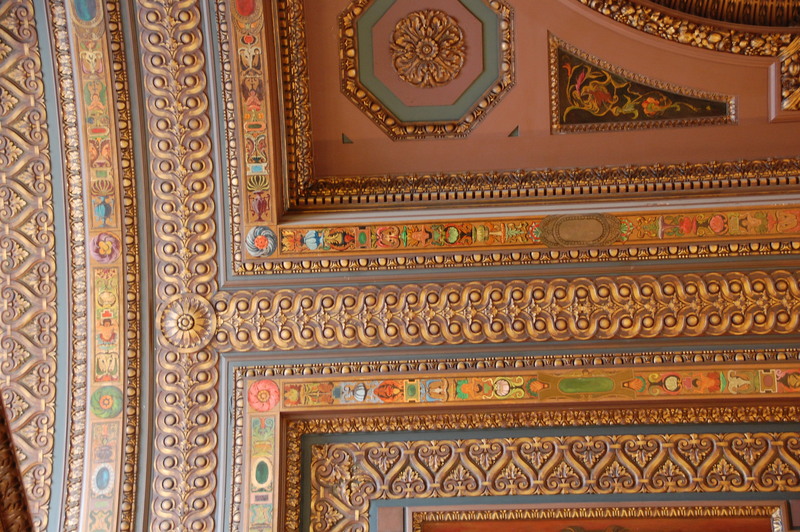 I especially liked the blue ceiling with gold zodiac designs painted on the ceiling amongst sprays of gold stars, as well as the traditional United States-themed carvings adorning the arch of every window. We exited at the back of Grand Central Station in hopes of discovering either one of the two comic book shops that were supposedly located nearby, to no avail. 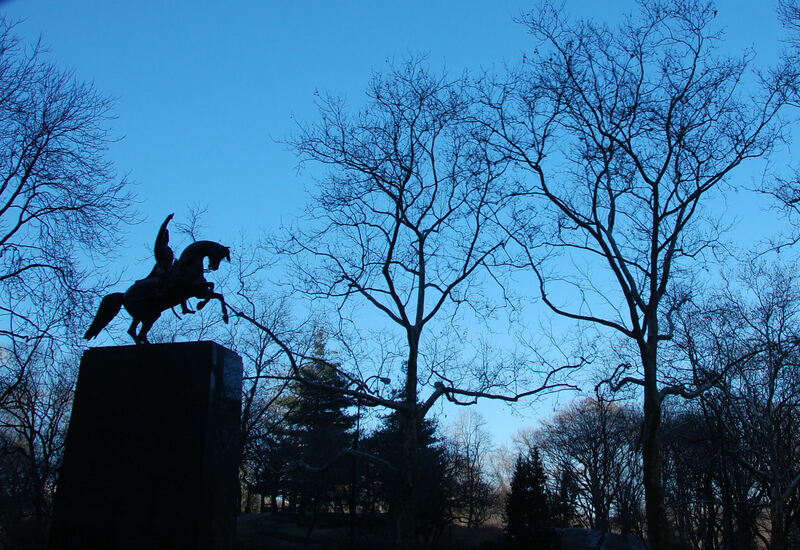 We walked several blocks north without comic luck, then doubled back to renew our search for Rockefeller Plaza. 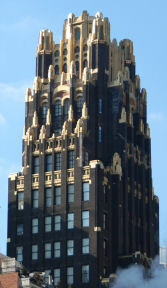 Facing the back of Grand Central, we saw the glorious American Radiator Building with its stunning gilded crown. Completely understated was Saks on 5th Avenue. Was it the back door or something? Tame window dressings and two quiet entrances greeted us. I took a photo for my mother, who would have wanted to walk inside. I am the antithesis of an American Shopper, however, and really could care less about the place. What we found at 630 5th Avenue was not what we were expecting to see: a rather ordinary tall building from sidewalk level. This was perhaps because we approached it only from 5th avenue and never actually saw 30 Rockefeller Plaza. Though I knew there was a plaza with a skating rink that was large enough to accommodate a gigantic Christmas tree…I had no idea where to find that plaza, and we were still scurrying to find a comic book shop and see the other high points on our list. 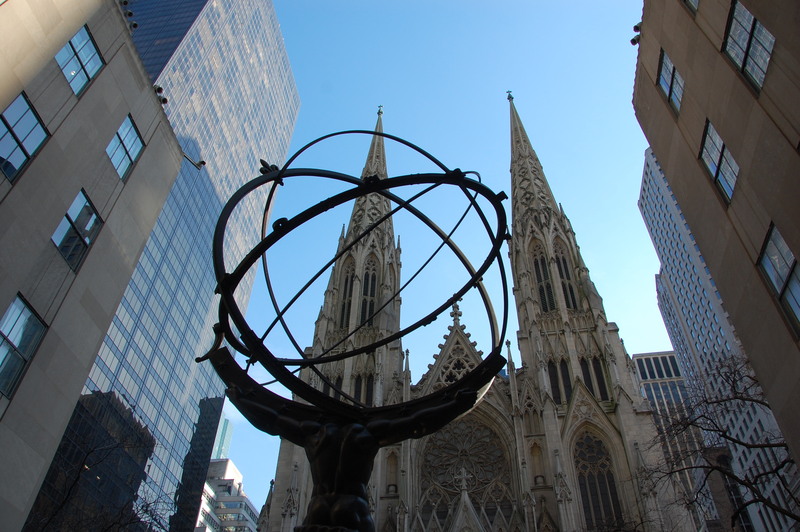 The Atlas sculpture on 5th Ave was exciting to see, because we recognized it, and though the street front was nothing worth blogging about, the building profile was also exciting to see, for the same reason – that we recognized it from the show “30 Rock” that we like to watch. We were blessed with stellar blue skies so that the sunlight lit the skyscrapers up till they glowed above us. St. Patrick’s Cathedral across the street was phenomenal. Simply stunning. I love that its timeless beauty has been preserved amidst such glass-and-steel modern buildings that pack the blocks in that part of the city. Its design would fit comfortably among the cathedrals I saw in France. Prior to the trip, I had wanted to enter the cathedral, but by the time we arrived at it, we did not feel we had the time available to go inside. Though it was shadowed by tall buildings, the front of St. Patrick’s is a brilliant sight, which had to be enough for the time being. We had one final address written down and we sought it out. I was a fool to wear attractive black leather boots that day. I wanted to avoid looking like my redneck roots just for one day in the city. I paid for it with blisters. Ugh – fashion bites. Tara was beside herself to find a comic book shop, and cranky with hunger and fatigue. So I walked on, resting only when I could no longer bear it. We passed Bryant Park again, turned a few corners, referenced our map, walked some more, and finally finally there it was!! Midtown Comics was the store to satisfy our great need. I sat on the floor while Tara perused the Teen Titans section. Final stop: Hard Rock Café, another must on Tara’s list. We called our taxi driver to come find us and then went back to the center of Times Square to grab a burger and fries. 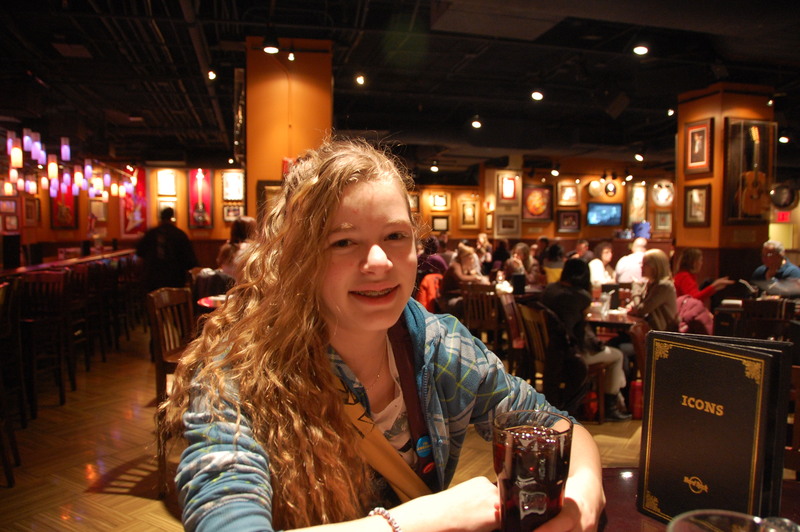 Seated in the Hard Rock Times Square, Tara was glowing with happiness, and I considered the day a success. Four hours later we were settling into our seats on Egypt Air, on our way to the other side of the planet. Trivia: I learned that this photo is of the GE building under construction. 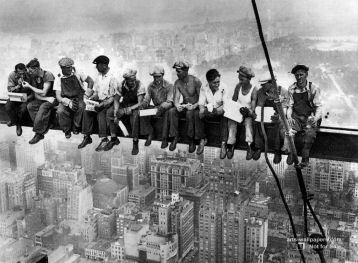 It’s called Lunch Atop a Skyscraper, and was taken in 1932 by Charles C. Ebbets.